1. Pacifier wipes. Ezra likes his pacifier like most of the rest of like eating raw lemons, but in just in case it miraculously works one day, I’ll be sure it’s clean first. These are also good for cleaning off toys that have candy bar crumbs from my bag fall on dirty floors. 2. A splat mat. I love this mat. I didn’t know I could be so excited about plastic floor coverings, but I can. It folds up really small, but unfolded is 4 ft across. All of Team Ev can fit on it for an impromptu picnic if needed. I have also used it as a makeshift changing pad while the other one is being washed. 3. My regular wallet. This doesn’t go everywhere, just to dr’s appointments and such. 4. My wristlet. This came with my amazing diaper bag and it’s really a lifesaver. I keep my phone, lip gloss, pens, etc., in here. It’s easy to grab when I need to buy something, and this way I don’t look like Mary Poppins digging for my wallet in line at CVS. 5. Roll of plastic bags. I think we all know why I might need these, so I won’t go into it. But I will say that Ezra inexplicably needs most of full wardrobe changes when we’re out in public. 6. Wipes case. Full of wipes, plus full of cute. 8. Back-up outfit. See above. 9. Hooter Hider. Yes, that’s the name. I wasn’t sure about it’s usefulness pre-Ezra but it has come in handy for feeding him a few times thus far. I’m sure the people walking by on the street and my fellow airplane riders will be happy I bought it as well. 10. 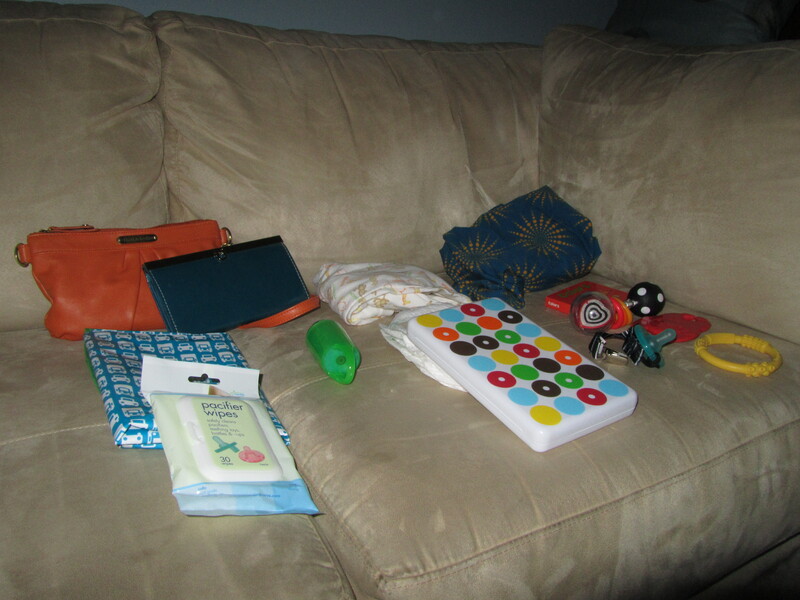 Make-my-baby-stop-crying items: Pacifier, rattle, teething ring, teething monkey and a book. Let’s just be honest about the book. It’s in there so I look smart to other parents who are judging me in public– (& I KNOW YOU ARE). If my kid is screaming the last thing he wants is a book, but at least you’ll think I’m a good mother when it “accidentally” falls out while I look for the pacifier–that also won’t work. We all know that what he really wants when he’s screaming is hiding under the Hooter Hider. 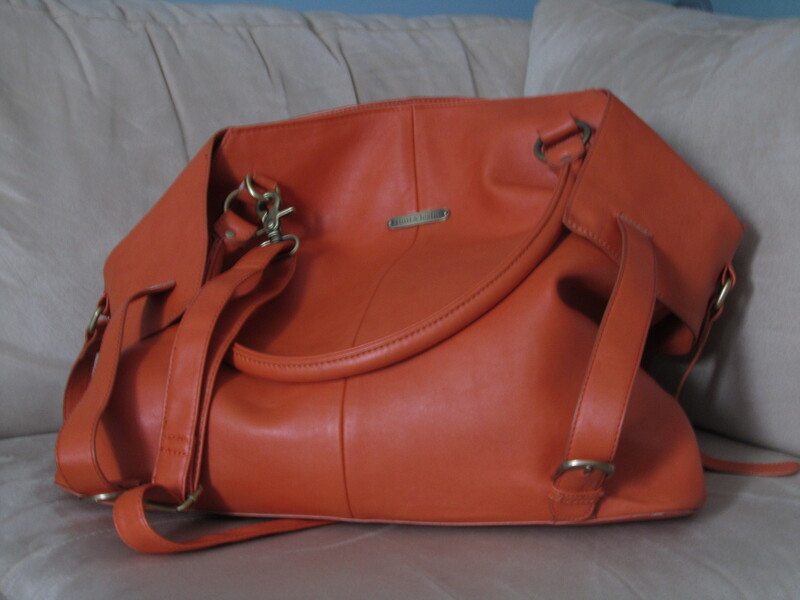 For reals though, I love this bag, and I will sing its praises to anyone. I wanted a diaper bag that didn’t look like one and was a bright, fun color, and this definitely fits the bill. It has multiple pockets inside, came with the Momma wristlet, a bottle thingymajig, can be used three ways (over the shoulder, across the body, and with the stroller straps), has a key holder, two hidden zippered pockets on the back, and is just over all awesome. I can fit everything seen above plus my Nook, a bottle of water, and at least one or two Reese’s PB Cup packages in it with no problem. Also, it’s orange. If I can’t have purple, then orange is the next best thing. Side rant: Just saw my beautiful purple bag is in production again and is for sale. Sigh. Wait? All of that fits in that bag? I totally need a bag like that 🙂 and to top it off it is beautiful! Aren’t you the orazanized mom?! I’m so impressed. My diaper bags are all lost. When my baby has an accident, I have to lug all of the kids back to my car, find a diaper (usually at least one size too small), clean him off with dried out wipes and put him back into the nasty clothes or leave him in a diaper only because I have no back ups. 🙂 Not a good planner…. I’m dropping by from the Alexa Hop with my sparkly little toolbar! I’d appreciate it if you would swing by A Helicopter Mom and comment!. Rach, since the bag is back in stock of the purple that you loved….. why not go ahead and purchase it, for a spare bag? U never know when you will need to switch out, food could spill out into it, or what ever the case may be!!! On a side note, The Orange is very pretty, and what a perfect style it is, too!!! Gina–The orange one costs more than I’d like to pay again, unfortunately. We did end up getting another, more functional one for his daycare bag. It is black wetsuit material, and is a backpack. Very light and easy for when we have to get him, the stroller, and the bag up the stairs.